← Hey Starbucks! What Year Is It? 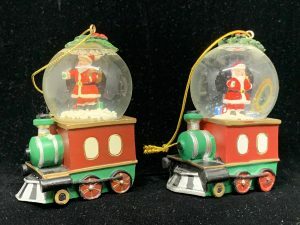 All aboard the Santa Train Snow Globe! cHOo, cHOo, cHOo! Starbucks Taiwan released two versions of this charming snow globe. One in 2005, the other in 2012. There are a few differences, but mostly they are the same. In the following pictures the 2005 is on the left, the 2012 on the right. Right here you can see one of the subtle differences. The 2005 seems just a bit ‘tighter’ and sharp in edges, font quality, and general appearance. The Santas are turned slightly different directions, the 2005 looking more of a forward direction. The 2012 uses a more snow-white color for the accents of the windows. The 2005 has more of a cream color. The biggest difference is the company name on the back of the train. 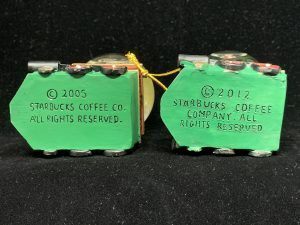 The 2005 version uses includes “Coffee” with the Starbucks and 2012 drops it in favor of just Starbucks. It’s just a matter of preference I suppose. Some have shared the 2005 is better than the 2012 and I have that impression as well. But a case could be made that the 2012 has more of a hand-crafted toy feel. 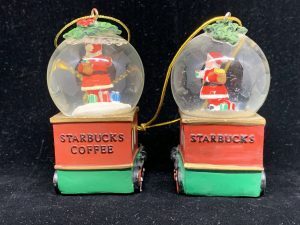 Ultimately they are very similar, however, and wonderful additions to the Starbucks Ornament collection.